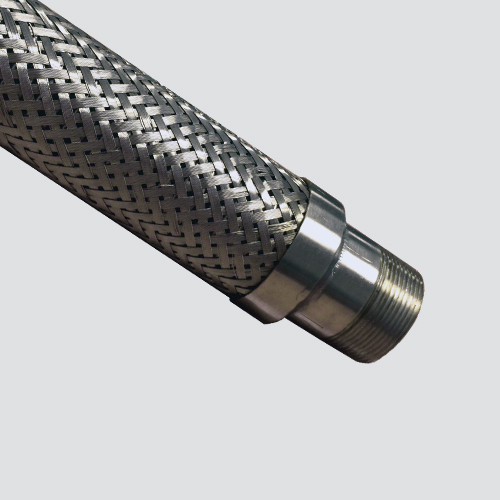 Our high performance annular corrugated stainless hose assemblies are ideal for applications requiring greater flexibility, corrosion resistance, and extreme temperature resistance, or where permeation precludes the use of rubber, PTFE, or plastic hose. Its constructed of hydro formed 321 stainless steel, annular corrugation with a 304 stainless steel outer braid, and is coupled with carbon steel welded-on schedule 80 male pipe thread fittings. Notes: Pressure ratings are reduced as temperatures exceed 300°F. Contact us for assistance.